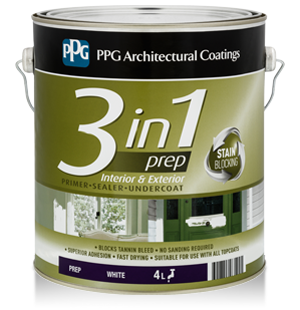 The PPG Architectural Coatings 3 in 1 is a primer, sealer and undercoat for both interior and exterior applications in one convenient package. Along with outstanding hiding, filling and sanding properties, the 3 in 1 is also rapid drying and features ‘no mess’ application. Surfaces must be clean and dry before painting. Dust down bare wallboards and interior timber. New concrete and cement render must be allowed to cure for 28 days before painting. Weathered timber must be sanded back to a sound surface. Remove all loose and flaking paint. Sand to feather edges before painting. Remove surface chalk and powder, dirt, oil and grease. Spot bare areas with 3 in 1 before applying a full coat. Do not use 3 in 1 on set plaster, fibrous plaster or plaster glass. Apply one coat by brush, roller or spray. A 10mm regular nap cover or similar will give best results. Up to 16m²/litre. 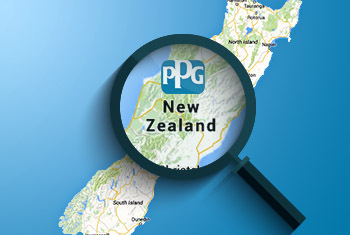 Coverage will be lower on rough or absorbent surfaces, typically 10m²/litre on new paper faced plasterboards.